​Four​ ​years​ ​later,​ ​at​ ​the​ ​completion​ ​of​ ​his​ ​titanic​ ​work,​ ​artists from​ ​all​ ​over​ ​Europe​ ​flocked​ ​to​ ​this​ ​small​ ​chapel,​ ​that​ ​is​ ​hidden​ ​in​ ​the​ ​cluster​ ​of Vatican​ ​architecture,​ ​to​ ​see​ ​what​ ​he​ ​had​ ​accomplished. 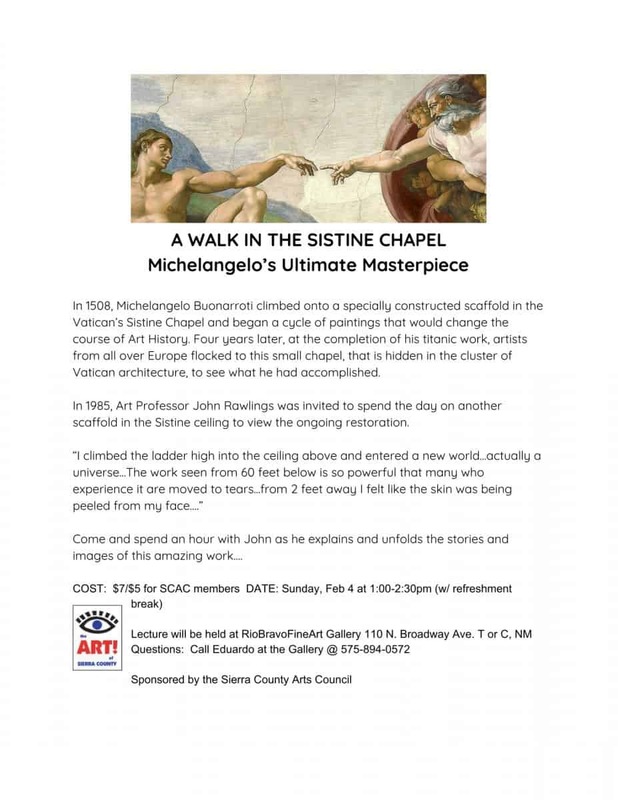 In​ ​1985,​ ​Art​ ​Professor​ ​John​ ​Rawlings​ ​was​ ​invited​ ​to​ ​spend​ ​the​ ​day​ ​on​ ​another scaffold​ ​in​ ​the​ ​Sistine​ ​ceiling​ ​to​ ​view​ ​the​ ​ongoing​ ​restoration. “I​ ​climbed​ ​the​ ​ladder​ ​high​ ​into​ ​the​ ​ceiling​ ​above​ ​and​ ​entered​ ​a​ ​new​ ​world…actually​ ​a universe…The​ ​work​ ​seen​ ​from​ ​60​ ​feet​ ​below​ ​is​ ​so​ ​powerful​ ​that​ ​many​ ​who experience​ ​it​ ​are​ ​moved​ ​to​ ​tears…from​ ​2​ ​feet​ ​away​ ​I​ ​felt​ ​like​ ​the​ ​skin​ ​was​ ​being peeled​ ​from​ ​my​ ​face….” Come​ ​and​ ​spend​ ​an​ ​hour​ ​with​ ​John​ ​as​ ​he​ ​explains​ ​and​ ​unfolds​ ​the​ ​stories​ ​and images​ ​of​ ​this​ ​amazing​ ​work. John and Souheir Rawlings are the Directors of the Elephant Butte Lake Artists Retreat held annually in January and February at the Damsite Historic District. This world renowned retreat hosts several amazing artists for 30 day intensive residencies at Sierra County’s Favorite Historic Site. Each 30 day residency will host a show at Rio Bravo. The dates of the shows coincide with the January and February Art walks on January 13 and February 10.